William Light's chart of the eastern side of St. Vincent Gulf from Rapid Bay north to the Port River with descriptions of the topography. Light spent considerable time on this coast as he searched for the harbour that had been identified along this shore several years prior by Captain Jones. Jones' description however was misleading and in fact the little harbour had been explored by his men William Field and William Pullen on 30 September 1836. The upper inset drawing shows the surveying or hatch boat in the inlet. 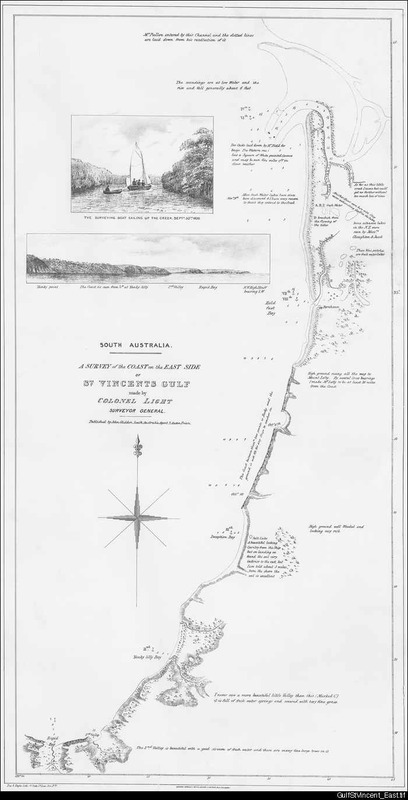 It would only be after extensive examination of the Gulf Saint Vincent that Light would confirm his favourable opinion of the Port River inlet and decide that the plain inland from Holdfast Bay would be the site for the main settlement of the new colony of South Australia. The chart bears numerous comments about the land and coast. Light recorded on the map that William Field laid buoys at the mouth of the Port River inlet to assist ships in identifying the hidden approach; that there were many fresh water and some brackish lakes adjacent to the coast. The Patawalonga Creek at Glenelg can be clearly seen at Holdfast Bay. Light had discovered this on 4 October. Sailing south on 6 October Light and his men discovered Field River. There was some confusion over the naming of this and the Onkaparinga River which was discovered on 10 October: neither of these are named on the map but are shown as the dates they were discovered. Deception Bay no longer appears on the South Australian map, and the spelling of Yanky Lilly Bay has been changed to Yankalilla Bay. Between Field River and the Onkaparinga (4 October and 10 October) Light warned against the rocky nature of the sea bed and described it as unfit for ships to anchor. This stretch of coast is full of rocky reefs, notably at Port Noarlunga and Christies Beach, and further south at Aldinga. Light's comments on the soil were invariably favourable.